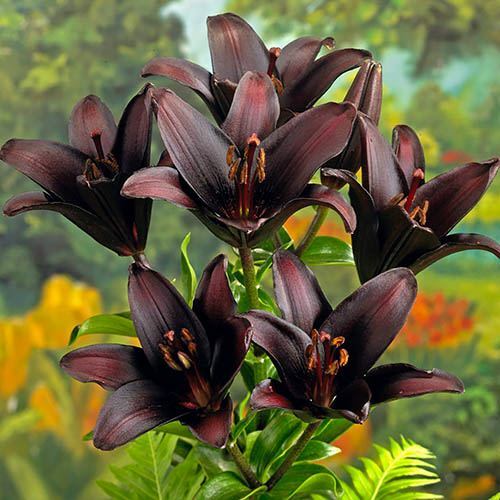 Probably the 'blackest' lily of all! After years of painstaking breeding, Landini Lily was born, and is the darkest Lily we know! Their upright stems will reach 1M tall, and each stem, will have 5 or more flowers on. They make interesting cut flowers, or leave in the garden. Try all 5 planted in a large pot too! They are very hardy over-Winter, so leave them to die back naturally as Autumn progresses. Supplied as a pack of 5 bulbs, ready for planting. Size 14/16. There is a certain fascination with so-called black flowers, although in nature, almost all are the deepest of velvet purples!!! After years of painstaking breeding, Landini Lily was born, and is the darkest Lily we know of by some way. They provide the perfect backdrop for neon bright flowers, their dark contrast setting the, off perfectly. Their upright stems will reach 1m (3ft) tall, and each stem, will have 5 or more flowers on. They make interesting cut flowers, or leave in the garden. Try all 5 planted in a large pot too! They are very hardy over-Winter, so leave them to die back naturally as Autumn progresses, to feed up the bulbs as they retreat underground. This gives bigger and better displays for years to come. Supplied as a pack of 5 bulbs, ready for planting. Size 14/16. Flowers in Summer. Plant about 10cm deep and 15cm apart in pots, watering well after planting.